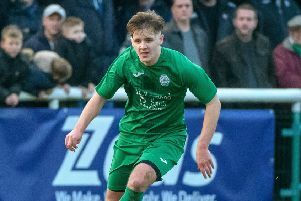 Biggleswade Town cruised to victory at Bedworth United and kept their slim hopes of a play-off place alive. Solomon Nwaboukei was the star of the show. All over the park, Sol was there tackling back, creating going forward, his quick feet getting him through impossible situations. It was topped off with a brilliant goal aided by Shaun Lucien. These final fixtures are must win games in Waders are going to make the play-offs and the boys, in changed kit of orange, certainly produced the magical goods for the first 45 minutes. Harry Draper, now fitting into the team game, gave notice early on with a snap header just wide. Sean Lucien, who was at his irrepressible best, provided the cross for the first goal on 16 minutes as the ball eluded Draper and found Liam Brooks at the far post for a simple tap in. Four minutes on and Nwaboukei danced down the right wing and found Kieron Forbes for the captain to double the lead. The Waders were very much in control as the close, fast football continued. Just past the half hour mark Nwaboukei got on the end of a ball lifted over the defence by Lucien to score and make the game look won even at this early stage. Bedworth did not offer much upfront but a loose ball in time added on at the end of the first half found the home 9 Levi Rowley firing in from close range, to make it 3-1 at the turn round. With such a lead Biggleswade unintentionally and unknowingly took the foot of the gas and were happy to play a containing game, with chances being created but not taken. Midway through the second period Harry Draper got a fourth to wrap up the game in style. At the other end Sam Donkin was rarely troubled with just a late free kick wide of the mark. It was a thoroughly convincing performance with the team getting back to their best at the right time of the season. There is only one reversal needed by Stratford, and victory in the last three games, and Biggleswade will sneak into the final play-off place. On this form it is a very real opportunity. Next up are already relegated Halesowen at Langford Road on Saturday followed by a crucial match at Stratford on Easter Monday.